• Cut off the top of the bread and hollow out. • Brush inside and outside with a little warm oil. • Keep it in a hot oven for about 5 to 10 minutes till the inside is dry. • Combine tomato sauce with chopped tomatoes, cubed Mozzarella, basil, Swiss cheese and the cubed sausage or salami, mix well. • Stuff the toasted loaf with the mixture. • Sprinkle with pepper, salt, garlic, oregano and grated cheese. • Place the pizza on a cookie sheet and bake at 400 degrees F for about 15 minutes till the loaf is golden brown and the filling is piping hot. 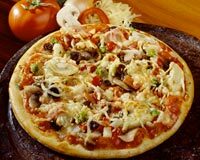 • Cut the pizza into thick slices and serve.